International Deliverables, LLC is recognized as the industry leader in integrating creativity and Creative Problem Solving (CPS) into project management. Professional services include training in creativity, developing a project management mindset, PMP certification training and project management consulting. I provide solutions of high-value and with high-impact results. Experience, effectiveness and efficiency in producing deliverables are the cornerstones for the success of International Deliverables, LLC. 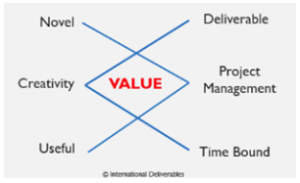 Why work with International Deliverables, LLC? You want a recognized leader in the field developing your teams. You want your project teams to understand and integrate the Creative Problem Solving process. You want your project managers to think critically and problem solve on demand. You want your project managers to identify the real problems inhibiting project success and to produce novel and useful solutions. You want your project managers to be driven by accountability and maximizers of best practices. You want your project managers to develop team capability, performance and productivity. You want your teams to shorten the amount of time it takes to solve problems and implement solutions. You want your teams to have the tools to address complex and ambiguous project challenges. You want your teams operating in a projectized mindset to produce short-term and mid-term deliverables as part of achieving long-term strategic and project goals. You want a credentialed project manager and educational provider delivering certification training. You want a certified PMP managing your strategic initiatives from inception through implementation. PMI certification. Research shows that certified PMPs deliver more projects on time and within budget, while achieving predetermined goals. Experience providing sustainable outcomes that increase business value and customer satisfaction. History of expeditious and thorough processes evaluation and remedy. Track record of building consensus with key partners and among cross-functional project teams with varying agendas. Exceptional interpersonal skills for managing client, vendor and stakeholder expectations. Polished written and oral communication for conveying project components to a variety of audiences. Detail orientation with a progressive leadership style. Courageously authentic, multi-lingual, hardworking, committed, ethical, self-motivated, creative, driven, and always focused on the big picture. Regardless of scope and industry, let's discuss your goals and project requirements and bring them to life and completion.